In these fun science activities you will be making placemats using fresh leaves off of trees. Spring time is a great time to make the leaf placemats. New leaves are soft and easy to use at this time of the year for stencils. Collect a variety of different sized leaves that will look good on a placemat. Decide on an arrangement of leaves for your placemat before starting to paint the leaves. After the placemat is designed take the leaves off the paper and set aside. Paint the bottom side of your first leaf. The veins on the bottom side stick out from the leaf. Place the painted side down on the placemat. Rub your fingers over the leaf so the paint is transferred to the paper. 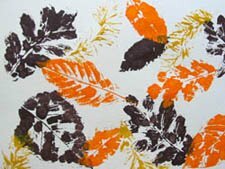 Continue painting leaves and rubbing them on the paper until you are satisfied with the design of the placemat. Let the paint dry thoroughly before covering with clear contact paper to make permanent placemats. Plants in the spring grow leaves to produce their own food. They take water from the ground and carbon dioxide from the air to make the food. Plants then use sunlight and chlorophyll to make the food needed by the plants. The chlorophyll gives the leaves their green color. In the fall plants stop making food. After the chlorophyll is gone from the leaves they turn yellow, orange and brown. Earthquake Activities, Earthquake Fault Blocks Create your own fault blocks that demonstrates how tsunamis occur during great earthquakes in the ocean! Science Activities, Links to activities on this page include building bridges, creating spouting water, growing sugar crystals and much more. Kids Fun Science The links on this page include information on science activities, science experiments, plate tectonics, the rock cycle and much more. Fun Science Activities, Leaf Placemats Create your own one of a kind leaf placemats in this fun and easy activities.